The coastline of Ostrobothnia in Western Finland is among the most beautiful regions in the Nordic Countries. The only UNESCO nature world heritage site in Finland is situated in Korsholm, in Kvarken, the archipelagoarea between Finland and Sweden. 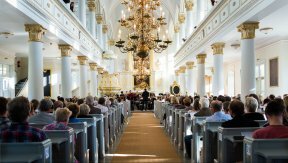 Since 1983 Korsholm Music Festival has invited leading nordic and international artists to perform in unique surroundings of historic concert halls, museums, rustic archipelago rooms and wooden churches, so typical for the westcoast of Finland. This all facinate both audience and performers. 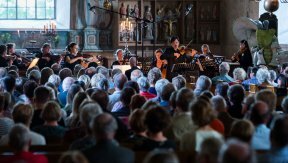 Composers as Alfred Schnittke, Erik Bergman and more lately Sebastian Fagerlund, Toshi Ichianagi and Matthew Whittall have honoured the festival with their music and presence. The repertoire is ranging from baroque and classical chamber works to contemporary music. Jazz in different forms is part of todays festival music. Master classes and student concerts also form an important part of the programme. Artistic Directors through the years have been Seppo Kimanen (1983), Dmitry Sitkovetsky (1984-1993, 2002), Frans Helmerson (1994 – 2001), John Storgårds 2004 – 2006), Dima Slobodeniouk (2007, 2009), Marko Ylönen (2003, 2008, 2010-2012) and now Henri Sigfridsson(2013 – 2017). From beginning of 2018 violinist and prof. Cecilia Zilliacus started as Artistic Director. 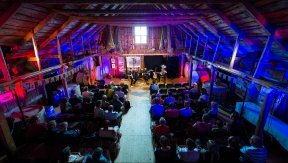 During 9 days in the end of July and beginning of August, Korsholm Music Festival offers you more than 30 concerts, from classic to jazz, for young, old and families. Nature and food experiences are offerend in addition to the concerts.